Efficient fleet management system plays a vital role in maintaining the stable flow of products in the businesses. In fact, industries like distribution agencies utilise computing equipment for its logistics operations. Its operation encompasses fleet managers, who are responsible for inputting the right commands in response to the said activity. As it bears a fast-paced environment, panel PCs are usually integrated with industrial keyboards. Its ruggedised components are built to withstand harsh working conditions. Its corrosion resistant overlay prevents liquid chemicals from damaging the key buttons. So, expect that this device can function whenever needed. Now, what makes this industrial peripheral device able to function well in distribution operations? Discover more on this blog why embedding industrial-grade keyboard is the best solution. In the past, fleet managers used simple unit record machines to process specific data [Automotive Fleet]. Today, a more advanced distribution management software are installed in industrial PCs, which features to translate large quantities of information within a short period. As a result, Managers can efficiently oversee multiple vehicle-related application activities using this system. Moreover, this application can function well in computing devices with industrial-grade peripherals including keyboards. Despite being advanced in computer application, operators must input the right command operations even in extreme working environments. Incorrect PC commands can result in an unresolved issue, leading to delay in the management operations. However, by embedding industrial-grade keyboards into its computing system, it can ensure that the right commands are input during the critical times. 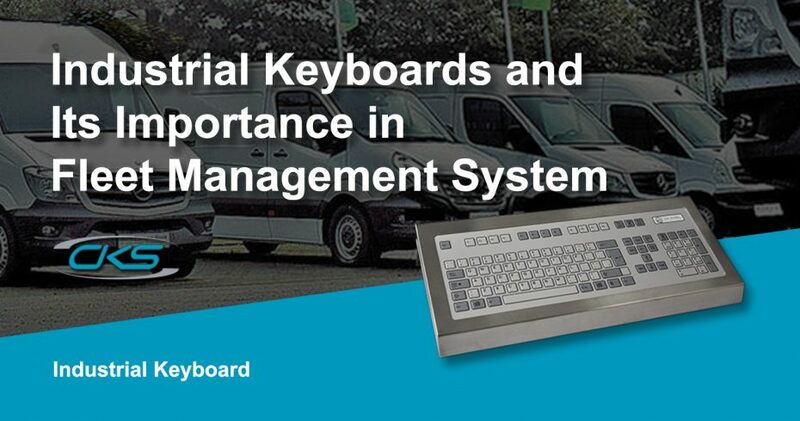 In the next section, find out how ruggedised keyboards are used to optimise fleet management operations. Do you know that using incompatible peripherals on an industrial PC can cause delays in the operation? Here are the top reasons why it is essential to use ruggedised keyboards to industrial computers. Many industrial-grade keyboards have embossed metal key buttons. This design helps users utilise the peripheral device without looking at the keys. This provides efficiency since users can focus more on the activities displayed on the monitor. As a result, fleet managers can send the right information and respond to issues swiftly. Rugged keyboards have mechanical buttons specifically designed to respond to the user input accurately. The spacing between each key prevents buttons from sticking with each other. Thus, it helps in allowing the users to input commands without the hassle of stuck key buttons. Industrial-grade keyboards are often built with a sealed, stainless steel casing. This feature protects the internal components from damage by dust, water, and dirt. Thus, it ensures that the device remains functional regardless of the working condition. Distribution companies operate in a fast-paced environment with complex operations, using only reliable computing devices with compatible peripherals. Moreover, integrating an industrial keyboard is one ideal solution for an effective fleet management system. Contact an industrial PC manufacturer today for more details on industrial keyboards.